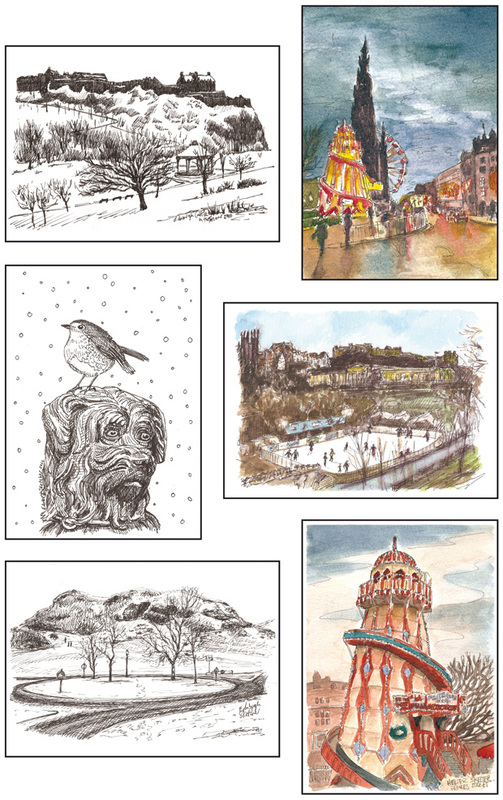 Here are my six Christmas cards for 2012, each a hand drawn sketch of Edinburgh in the winter. Including the simple ‘Merry Christmas’ message inside each A5 card comes with a white envelope. The pack of six different designs costs £4.50 plus pnp direct from my site, or £5 from various places around Edinburgh. I will add places you can buy them below as they become available. £1 from each pack of cards will go to the Royal Hospital for Sick Children charity; The Sick Kids Friends Foundation. A charity very close to my heart and one that does amazing work every day of the year to make the lives of the children and the families of the children in the hospital a little easier. To buy a pack of cards direct from my Shop please click HERE. EdinburghSketcher packs of 6 Christmas cards are now on sale at the Hula Juicebar on Victoria Street, near the Grassmarket. Pop in for a pack and a lovely smoothie, they do great coffee and yummy bagels too!